Kadiatou Samura proudly showed her pristine new toilet to her Member of Parliament, the leader of her chiefdom and the head of the UN Children’s Fund’s district office as they toured her village, Kamayintin, in Sierra Leone’s Bombali district. The village was celebrating its status as the chiefdom’s fifth to be declared “free of open defecation”. The toilet was elegant and simple: an earth floor, walls built from local wood, topped by a conical straw roof. Samura built it herself with the help of 12 other families in the village, who together built 17 toilets in a month. “This toilet has saved us from sickness. Fewer of our children are falling ill from diarrhoea now,” Samura told IRIN. This is her family’s first toilet. Before she had always gone to the bush 100m away, or placed her children outside the family hut to defecate, throwing the waste into the bush. A ‘kaka map’ drawn by residents showed most villagers did likewise, some also using a river 1km away – a source of water for bathing and cooking. Just a third of rural Sierra Leoneans have access to clean water and to sanitation facilities, according to UNICEF’s Victor Kinyanjui, water, sanitation, hygiene manager. Diarrhoea is the third leading cause of death in children under five in Sierra Leone. Reversing old aid models whereby outsiders pay for and construct expensive latrines that villagers cannot afford to maintain, in this approach villagers choose their own latrine models, find the materials locally, raise money if necessary and then build them, said Kinyanjui. Sanitation experts guide villagers on the types of toilet to suit their topography and budget. Samura’s latrine – assuming the free labour of her fellow villagers – cost her nothing, whereas a standard modern latrine can cost up to US$100, according to Kinyanjui – equivalent to a third of annual earnings for most Sierra Leoneans. “In the old approach we instructed the community; in this one we [step back] and they lead the way. We need community members to take charge,” said Kinyanjui. UNICEF’s aims to roll it out across 10 districts of the country by 2010, with ActionAid, Plan International, Oxfam, and GOAL, implementing the project. “We want defecation-free villages. 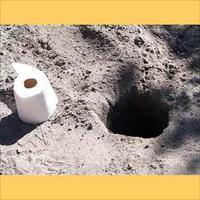 Even if a village has one open defecation, it is not working,” Kinyanjui said. Not all are convinced by the new approach. District councillor Eric Ceesay prefers the “safe, clean, concrete toilets” that international agencies – including UNICEF – used to build. Some 560 of these have been built over the years, and the district needs a further 1,500, Ceesay said. The change needs to be fast, he stresses, if Sierra Leone is to reach international goals to double the number who can access clean water and sanitation by 2015. Women’s leader Kamu said communities will have to be vigilant about maintaining their toilets to make them last. To reinforce this, local chiefs should resurrect now moribund local by-laws giving health inspectors the right to assess households’ hygiene levels and to exact fines of up to 16 US cents when they are sub-standard, Serra Limba Chief Kandeh Luseine said. In the meantime, community leaders are ready to spread their message. “We want to persuade other villages to be open-defecation-free. Organisations that give us support today may not have money to give tomorrow, so we have to be able to carry on this work ourselves,” Kamu said.